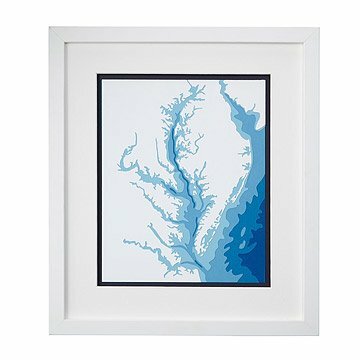 Relive memories of the Chesapeake Bay with this beautiful representation made from layers of hand-cut paper. Handcrafted in elaborate detail, this representation of the Chesapeake Bay is made from layers of hand cut paper. Made by Marnie Karger, each unique topographic map showcases the depths of the water in bright blue hues. The layers create bold, three-dimensional intrigue, while the beautifully cut shorelines serve as a refreshing reminder of home. Handmade in Minnesota. Framed in Oregon. Perfect for anyone who lives near the Chesapeake Bay! Sent to to my mom as a birthday/mother's day combo present. She loved it! Said it was the perfect size. We've been living near the Bay forever, and she wanted something to put on her wall for it. Perfect!